Brisbane too strong for NT Thunder in wet-weather contest. 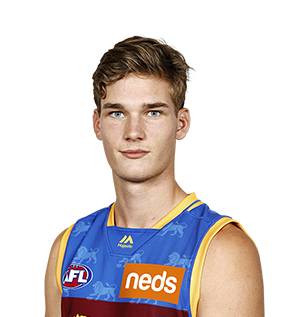 The Brisbane Lions picked up Gippsland Power's 197cm tall key defender/ruckman Sam Skinner with pick #47 in the National Draft. Skinner is a key defender who can also go forward and impact a game. A versatile player, Skinner is also known to contribute as a second ruckman. Skinner played two matches at the NAB AFL Under-18 Championships, averaging nine possessions and 4.5 tackles, before injuring his knee and ending his Season. Skinner was also a member of the NAB AFL Academy. • Sam Skinner experienced the highs and lows of professional sport in 2017. 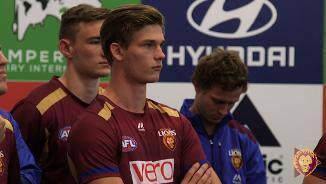 • After a lengthy layoff following an ACL tear, Skinner made his return for the Lions in the NEAFL in late May. • Playing mostly in defence, Skinner immediately made an impact with his attack on the ball and skills in the air. 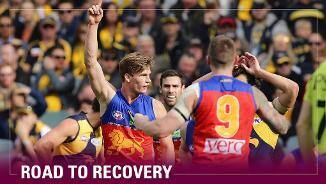 • Skinner made his Senior debut in Round 19 against the West Coast Eagles. 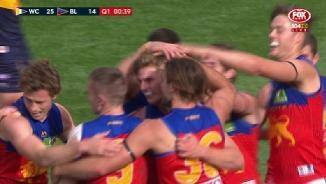 Skinner acquainted himself well against the Eagles, kicking two goals and producing a couple of monster tackles. • Unfortunately, Skinner tore his ACL again in an awkward tackle during a NEAFL game against the GWS Giants in August. • Skinner re-signed with the Lions until the end of 2019 midway through the year. • Skinner was set to make his AFL debut against Port Adelaide in round 19 until a hyperextension to his knee during training was discovered to be more serious than initially thought, and would require a full ACL reconstruction. • The promising big man began his career with the Lions rehabbing an ACL injury sustained while playing for Vic Metro. • While a disappointing setback, Skinner has been described as one of the club’s most “professional and dedicated” young players and will no doubt work hard to give himself the best chance to debut in 2017.